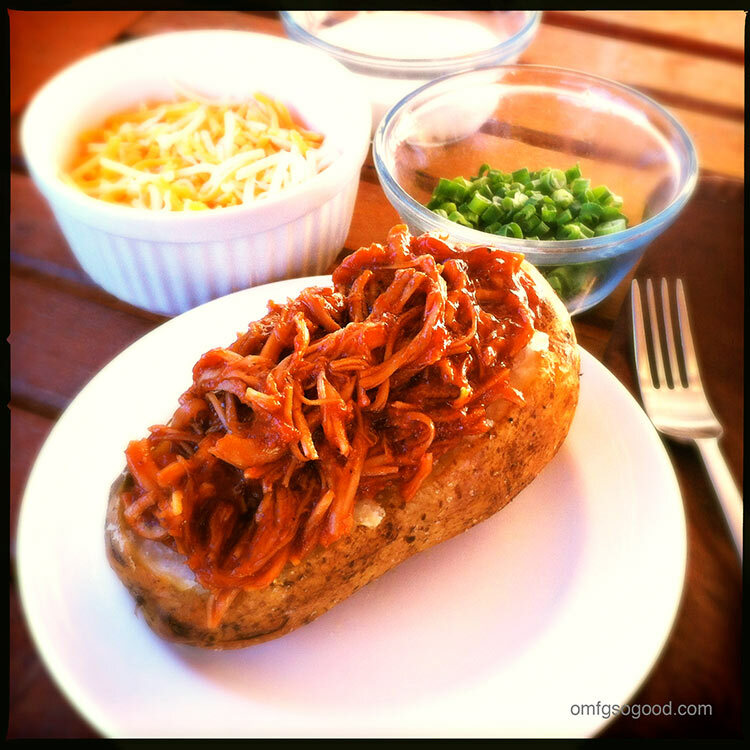 BBQ turkey baked potatoes | omfg. so good. Instead I’m eating a bowl of Corn Flakes, staring at a mountain of rumpled clothing that has somehow grown to the height of my desk in the course of three days. I tried to convince Jonny last week that we should start wearing paper clothes. Then we could just throw them in the recycling bin at the end of the day… well, everything but the paper undies, because that would just be wrong. He thought it was a ridiculous idea, but I beg to differ. Think about it, you could just spill BBQ sauce all over your shirt and it wouldn’t even matter. Shirt doubles as napkin. Win. Win. I seriously think I’m on to something here. Preheat the oven to 350 degrees and position the racks in the top and bottom thirds. Wash the potatoes thoroughly, pat dry with a paper towel then poke several holes in the skin with a fork to release steam during baking. Rub the potatoes with canola or vegetable oil and sprinkle with salt, then place them directly on the upper rack to bake. Place a sheet pan on the lower rack to catch any drippings. Bake for around 1 hour or until the skin is crispy but the potato itself feels softened. While the potatoes are baking, make the sauce by combining all of the sauce ingredients in a heavy saucepan over high heat and whisk until smooth. When the mixture comes to a boil, reduce the heat and simmer uncovered for 30 – 45 minutes. Once the mixture has thickened, remove it from the heat, transfer to a heat safe (glass bowl) and set aside. 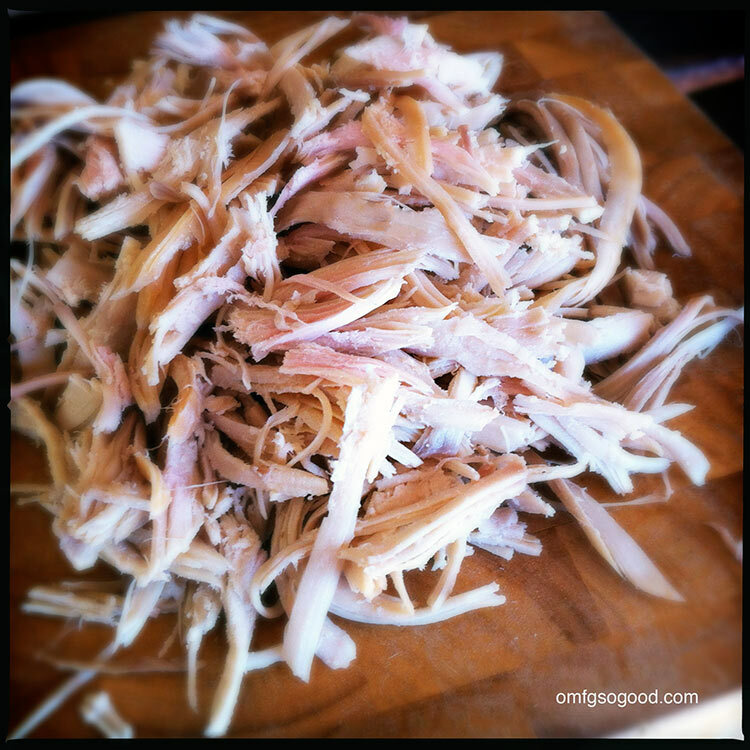 Using a fork, shred the roasted turkey breast (our local grocery sells these pre-roasted in their deli with the rotisserie chickens. Add this to the BBQ sauce and toss to evenly coat. Then top with sour cream, shredded cheese and diced green onions. Uh huh. Paper shirt/napkin. Not so ridiculous after all. This is a perfect easy to put together dinner on the go! 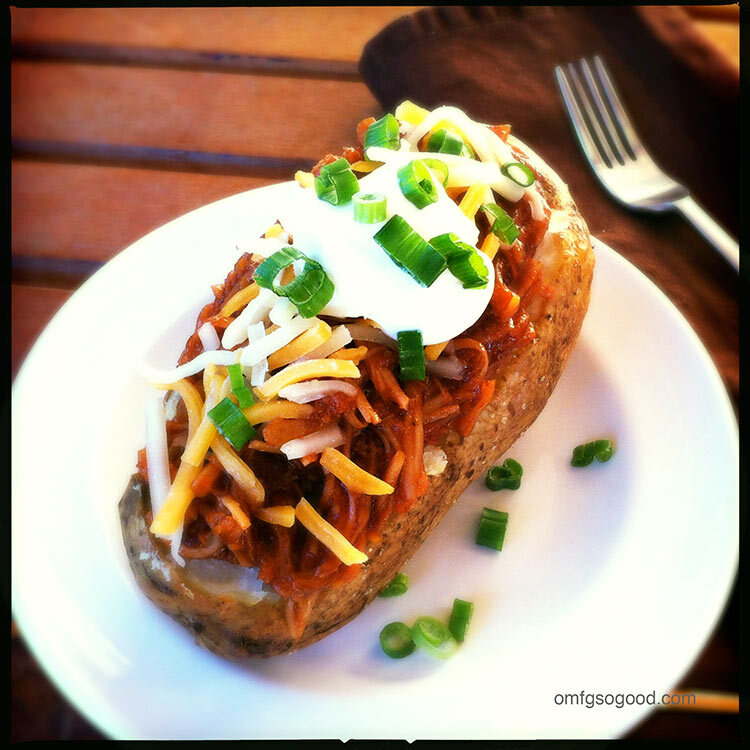 I love baked potatoes but never thought of putting meat in them to make a whole meal out of it. Great idea!